As I look into being in the world and not of the world… as I abstract the visible into the invisible… I find something to share in the Dormition of the Most Holy Theotokos. 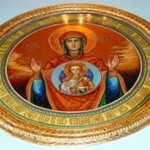 August 15th marks the day when we at last come to the Great Feast of the Dormition of the Most Holy Theotokos. It is the last Great Feast of the Church calendar year (although I began the series of Great Feasts on the secular calendar year and so I still have four more to write about). After an ardent two week fast, split up by the feast of the Transfiguration, we come to commemorate the falling asleep of the Mother of God. Not simply death, as you would find in one’s soul who ends with the Fallen One, but a falling asleep: a temporary condition where there is still life to come. For her, life came sooner, and, after three days since her body had been brought to Gethsemane by the apostles and buried, she was taken up to her Son in both Body and Spirit. For us, we will fall asleep too, and wait for our Lord to call us into His kingdom. Yes, we too must prepare for falling asleep, just as we prepare for this day of remembrance. We worship the Lord our God and honor Him through honoring she who alone could bear the seed of the Holy Spirit. In church service, through fasting and through keeping a humble heart and revealing our love for one another – if we truly Love Him, so we love others as well – we complete this preparation. And so comes the day when we celebrate the feast, ever so tired and weary from an empty stomach yet energized in the soul, and we see that she fell asleep and yet experienced the bodily ascension to sit with her Son. Now let’s abstract this experience here on earth in the celebration of this day, and take the tools we use with us through each and every other season, each and every feast… each and every day. With this, we too will fall asleep – but there the journey does not end. Through the examples of His Resurrection and the Most Holy Theotokos’ ascension we see again the promise of our Lord and Savior Jesus Christ. The Church calendar year thus ends with the falling asleep of the Most Holy Theotokos and in September begins with its first feast: The Nativity of the Theotokos. Here we see how the end of the beginning comes to fruition. She falls asleep, and yet is alive in spirit as well as body for eternity to come. At the same time on earth we celebrate her falling asleep followed by her birth. Is it not as if we will be born again when we are risen to judgment and, through our Christian life and His ultimate sacrifice, also see eternity? This, to me, is a real purpose of following the Church and the cycle of past ages. It is not at all about suffering alone through the demonic distractions simply because we are sinners and in this way we get another day closer to Him; keeping our head barely above water as a status quo Christian is not a means to the end. It takes much more: rather through the tangible tools of the Word and His Church we can truly gain solace, comfort, hope and thus find a path to persevere under secular pressures and oppression. Only then can the reality of torture we and those we love crawl under be realized as the illusion, so that the dream and vision of the invisible presence and heaven to come can translate into our simple minds as the reality – not through the corporeal senses of eyes and ears, but instead through the Word and Light which the Holy Spirit can only deliver… the true sixth sense.